Minor League Baseball continues to grow in popularity. In 2014 a record 42.4 million fans attended Minor League Baseball games across the country, an increase of more than 850,000 over 2013. To put that in perspective, the total attendance for the NFL’s 2014 season was about 17.6 million. 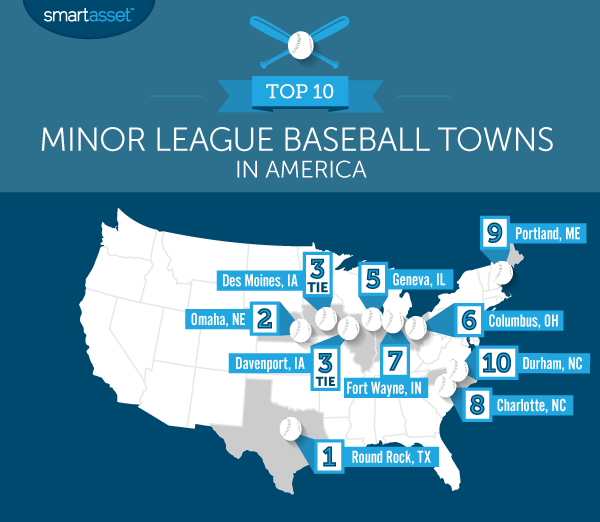 This is SmartAsset’s second annual ranking of America’s Best Minor League Baseball Towns. See the 2016 ranking here. What, exactly, makes Minor League Baseball (MiLB) so popular? After all, it doesn’t have the superstars that draw fans to other professional sporting events and the winners of MiLB championships can’t claim to be the best in the world. Instead, MiLB relies on a strong sense of community between fans, teams and the towns in which they play. MiLB games are generally affordable and family-friendly – the perfect way to spend a summer afternoon. 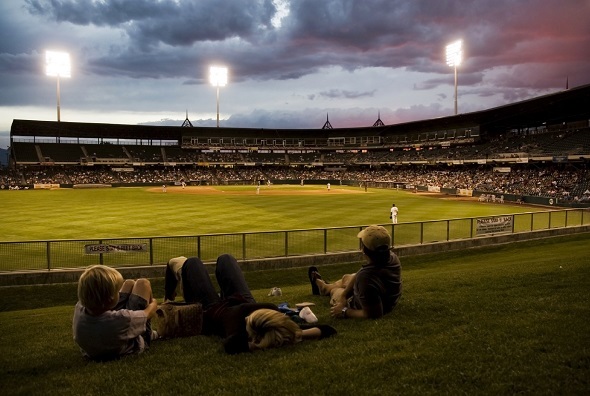 SmartAsset’s study of America’s Best Minor League Baseball Towns considered two main factors. Using a data-driven approach, we wanted to determine the quality of life in each town, as well as the quality of the game day experience enjoyed in each stadium. To that end, we calculated two separate scores for each town, based on nine individual metrics. These metrics are the same as those used in last year’s study, though we added average attendance (as a percentage of stadium capacity) to better capture the energy in the stadium at game time. Violent crime per 100,000 residents. Property crime per 100,000 residents. Income after housing costs – the difference between median household income and median annual housing costs, including taxes, insurance and mortgage payments or rent. Minor league class – AAA is best, followed by (in this order) AA, High A, Low A, Short-Season and Rookie. Average attendance as percentage of stadium capacity. Stadium rank – a ranking of every minor league ballpark, as determined by StadiumJourney.com. To create the two scores based on these metrics, we ranked every town and team according to each metric and assigned points based on that ranking. A team with the best overall ranking for a given metric received 159 points, while a team with the worst ranking (the highest crime rate, for example) received 1 point. We then totaled the points for each category and indexed those totals to 100, with the highest total receiving a 100. Lastly, we averaged the two scores, giving equal weight to each. Round Rock takes first. After ranking as America’s eighth best minor league baseball town in 2014, Round Rock, Texas leaps into the top spot. The Round Rock Express improved their regular season record to 78-66 this year after going 70-74 last season. Texas steals the show. The Lone Star State grabbed five of the top 25 spots in our ranking. Joining Round Rock were Midland, Frisco, El Paso and Corpus Christi. Iowa hits a double. Davenport and Des Moines tied for third with an identical overall score of 89.87. While Davenport’s game day experience rated slightly higher in our analysis, Des Moines had the edge in overall quality of life. After posting more losses than wins in 2014, the Round Rock Express flipped the script in 2015 and fielded the top team in the American Southern division of the Pacific Coast League (PCL). In the process, the team’s average attendance rose to 8,509, fifth highest in MiLB, equal to 85% of their stadium capacity. The home team had fans in Round Rock smiling this summer, but they have plenty of other reasons to cheer. The city’s unemployment rate is just 3.2%, eighth highest in our study. Likewise, while the city’s median income is about $70,000, annual housing costs average just $15,264. That adds up to the eighth highest discretionary income of any Minor League Baseball town – more money to spend on baseball tickets. Winners of back-to-back Triple-A championships in 2013 and 2014, the Storm Chasers have at last been dethroned, though not for lack of trying. Their 80-64 regular season record this year is better than the record they posted in either championship season, but because of fierce competition in the PCL’s American Conference, they failed to make the playoffs. Moving to Omaha? Find out how much house you can afford. Nonetheless, Storm Chasers fans have plenty to feel good about. Their city enjoys the fourth lowest unemployment rate of any MiLB town, at just 2.9% (as of June 2015). Even in Minor League Baseball, where delicacies such as the Grilled Cheese Hot Dog or the Pulled Pork Parfait can make the game seem like a sideshow, everyone has more fun when the home team wins. In 2015, fans of the Quad City River Bandits must have had a lot of fun. The team won 88 games, posting the best regular season record of any team. Add to that a top-20 stadium according to StadiumJourney.com and attendance that averages 95% of capacity, and you have one of the best atmospheres in all of baseball. With a population of nearly 210,000, Des Moines is one of the largest cities with a Minor League Baseball team. The Cubs have played in Des Moines since 1969, when they were known as the Oaks. They changed names in 1981 when they became affiliated with the Chicago Cubs. While the Des Moines team has had about as much success winning championships as the parent organization, it still draws plenty of fans on a nightly basis. In 2015, average attendance for the Iowa Cubs was 7,381, 15th highest in MiLB. Located along the Fox River an hour west of Chicago, Geneva is a charming small town of just over 20,000 residents. It rated first among all Minor League Baseball towns for its quality of life, scoring a perfect 100. One reason for that high rating? Geneva is extremely safe. It has the lowest violent crime rate of any MiLB town, with 9 violent crimes per every 100,000 residents. Whether they are walking to a game or walking around town afterwards, baseball fans in Geneva can feel safe doing so. If you’ve never been to a Minor League Baseball game before, Columbus would be a great place to start. The Clippers averaged nearly 9,000 fans at every game in 2015, filling their stadium to 89% capacity. After visiting every stadium in MiLB, StadiumJourney.com ranked Huntington Park as the sixth best (out of 159). They also notched 83 wins to just 61 losses during the 2015 regular season, among the best records in Minor League Baseball. Those are all reasons why Columbus had the top rated game day experience in 2015, scoring a perfect 100 for that measure. In 2009 the TinCaps began playing in a brand new stadium in downtown Fort Wayne. Today, Parkview Field is rated as the best stadium in all of Minor League Baseball, and TinCaps fans regularly fill it to near capacity. Visitors to Parkview Field should make sure to try the Big Apple, a five pound dessert that includes four servings of apple crisp and five scoops of vanilla ice cream. Charlotte averaged 9,400 fans per game this year, 92% of their stadium’s capacity. That’s the sixth highest average percent capacity of any team in the minors and one reason Charlotte had the second-best game day experience of any team in 2015. The top town in last year’s ranking, Portland slips this year after a disappointing season from the Sea Dogs. The team went just 53-89 in 2015 after winning 88 games last year. That performance dampened attendance somewhat, though the Sea Dogs did average a respectable 73% of capacity. Nonetheless, Portland remains one of the top places in America to catch an MiLB game. It has the fifth highest concentration of dining and entertainment establishments, with more than 30 for every 10,000 residents. That means there’s plenty to do after the final swing of the bat. In our analysis, Durham’s game day experience ranked third in all of Minor League Baseball, with a total score of 98.73. Among the reasons for that high rating was the team’s strong attendance, filling the stadium to 78% of capacity on average, and the well-regarded Durham Bulls Athletic Park. This year Durham fans enjoyed eight starts from one of the best pitchers in the minors. Blake Snell was voted MiLB player of the year by USAToday. Durham also holds a special place in the hearts of sports movies fans. The team and city were the subject and setting of the 1988 classic Bull Durham. Read the 2016 edition of this study. 1. Data on violent crime and property crime rates came from the FBI’s Uniform Crime Reporting database as well as local police department websites. Data on the unemployment rate came from the Bureau of Labor Statistics. Data on median annual income and median annual housing costs came from the U.S. Census Bureau, as did data on the number of dining and entertainment establishments per capita.